1. The other day my house was a disaster that would never be clean again EVER, my kids were whiny, needy and JUST TOO LOUD and I had this overwhelming desire to go after my husband with a blunt object. Then I did some counting on the calendar. Maybe it wasn't them. Maybe it was just me Yep. It's the most wonderful time of the month. So I had a chocolate or six and went to bed. Sometimes it's best just to go hide. 2. This semester at my Mom's morning out I am doing a Bible study on the Psalms. It's fascinating. It also has a fair bit of homework. I am also participating with my whole church in reading the New Testament in 100 days, plus I am trying to be a part of Elizabeth Esther's book club on Evangelical is Not Enough. I may have bitten off a little bit more than I can chew. And by may I mean for absolute certain. This may explain the thick layer of dust this blog is getting. 3. Ever since Nicole mentioned it on her blog the other day I have had the theme music from the 88 winter Olympics running through my head. It has brought back memories best left alone. When the Olympics were here my brother learned to play the theme on the piano. And he played it. And played it. And played it some more. And yet, never with a level of proficiency that would make it worth listening to. I think my mom finally hid the sheet music so we could retain what little was left of our sanity. 4. Is it just me or are skinny jeans just getting skinnier and skinnier? I saw some prepubescent girls in some yesterday that I am certain required some form of lubricant to get on and off. I am not exactly sure how they were able to maintain circulation in their legs. 5. And can I say how thrilled I am that I do not have girls so that I do not have to explain exactly why we won't be wearing skinny jeans in our house. 6. I, like many of you have been reading the Livesay blog from Haiti. If you don't you really ought to. They bring a perspective on the crisis that you just can't get on the news. Plus, it has helped me remember to pray for the Haitian people even though it isn't at the front of the news media anymore. 7. Hey January! You're outta here! Yippie!!!!!!!!!!!!!!!!!!!!!!! Buh-bye you bleak month of nothing fun! Hello February, you might be cold, but you bring Valentines day, Family day (it's a statutory holiday here in Alberta) and there are only 28 days to ya. I can endure anything for 28 days. For more quick takes that may actually be interesting, head on over to Jennifer's at Conversion Diary. I work in the kids ministry at our church. Basically I work with a table-full of kindergarden and grade one kids. I keep them corralled and somewhat on task. While I usually work with the same wonderful group of kids, at Christmas time they had all the groups move from station to station while the teachers stayed put and did Christmas crafts with the kids. We have about 40 little ones in our area so this is where nametags really come in handy. One sweet and very spunky little girl arrived at my table eyes brimming with mischief. I soon learned why. Her nametag was upside down. She looked most pleased with herself. I quickly choose the ugliest name I could think of an uncommon name and called her that the whole time she was at my table. "Mildred" LOVED it. She laughed and giggled and had a grand old time. Just an aside here, if your name is Mildred, I am sorry for making fun of your name. (Well, not totally, but I am Canadian so I have to pretend that I am sorry.) Remember though, I own a Christmas sweater. My tastes may be a little suspect. If this is your favorite name for your baby, well, I will do my level best not to make fun of her name to her face. I make no guarantees for when she is not around. Anyway, I later saw the little girl with her family after class and once again called her Mildred. Her mom (whom I only know slightly) gave me a bit of a puzzled look. So I explained. Then she told me something that explained the odd look. Guess what the girl's grandma's name is. Go on, take a guess. I was making fun of her paternal grandma's name. It gets better. I had never met her dad until this moment. He and his family just moved here this summer as he is our new youth pastor. Nothing says "welcome to our church" like making fun of his mom's name. At least I didn't knock him over. The other day I snuck to the shower while the boys were playing nicely. Of course, that meant that they had to hunt me down as quickly as possible. Sprout came in and we had the following conversation. Turns out, my first grade teacher was wrong. There ARE stupid questions. HG: What does it look like I am doing? Sprout: You is taking a shower. HG: Yes, now go play. Sprout: Can I watch ya? Sprout: Do you like your shower? It is at this point that I realize that my discipline options are currently limited, seeing as how I am n*aked and now have shampoo in my eyes. I just begin to hope that he will soon lose interest in talking to me. Because I like to dream big. Sprout: Do you pee in the shower? At this point I rinse, deal with my son and vow to wear flip flops while showering until he moves out. A long time ago I made a commitment to myself to not blog when my kids were awake. I'm beginning to have a bit of a problem with that. They are ALWAYS awake. ALWAYS. And when they sleep I either want to drop into a big heap on the floor, take a bath or restore my house to some sort of semblance of order. Think? Not so much. PLUS, our days have not been all that interesting. They've been good days (and some not so good) but ordinary. And while I think ordinary rocks, it doesn't make for a good blog. At least not for this blogger. Because I have a sneaking suspicion that none of you care to hear that ground beef is on sale at Co-op which has sort of been the highlight of my week this week. Well, that and no one has pooped or peed on my floor. Woot Woot. See, scintillating it is not. Anyway, I was sort of lamenting the lack of "excitement" around here as I drove to my massage the other night. (Insert ominous foreshadowing music). Way Cooler has a great extended health plan which covers a wack-load of massages every year. So I was headed to one my little brother had recommended. I'd never been there before and I made a wrong turn. (The music gets louder) No problem. I went to flip a u-turn on a narrow side street. And found myself stuck in a snowbank. Yahoo, I solved the whole nothing to blog about problem nicely. Now if I could just get out of the flipping snowbank. It turns out, that no matter how independent I try to be, this is one problem I just could not solve myself. I had to end up calling my brother. I would have called my husband but he was at home with our kids and the carseats, well, they were with me. Which effectively stranded him. And here is where I'd like to publicly apologize to my brother for all the names I called him growing up. I'd also like to apologize for tattling, teasing, lying and that unfortunate incident with the ski-pole. He came right way. He hooked my van up to my truck, pulled me out and didn't once laugh. Even though I KNOW he wanted to. I was stuck in a SNOWBANK for crying out loud. My parents had always told us growing up that we should look out for each other. Because that is what family does. I'm so glad he listened. The Number Between 6 and 8. 1. Haiti has been on my heart and mind the last few days. As I am sure with many of you. If you are looking for ways to give, Compassion already serves 65,00o children in Haiti. They estimate that a third of them lived in areas hardest hit. They desperately need our support. We can speculate all we want on why this happened, or we can do stuff to support the ones it happened to. Just click here to be taken to Compassion's site. 2. I've decided to never take my kids to Disney. Total waste of money. I just need to take them to a carwash. They were almost coming unglued at the sheer excitement of water pouring over my filthy van. Me too, but that was because I would actually be able to see out the windows. Visibility makes me happy. On second thought maybe it's a waste of money to take me to Disney too. 3. Just a heads up, it's a bad idea to go through a carwash when one really, really needs to visit the bathroom. A VERY BAD IDEA. 4. The Olympic torch comes to town on Monday. I'm debating whether taking the boys to see it is a good memory maker or just a sanity taker. What do you think? 5. While hunting for bargains this summer I found this game. It has turned out to be one of their favorite Christmas gifts this year. Which delights me because I got it for two bucks at Wal-Mart. The whole sharing-is-fun part of the game is REALLY cheesy but the rest of it is actually quite fun. It's not your typical boardgame and it has some eye-hand co-ordination activities in there that are excellent for my son with the motor planning issues. 6. Have I mentioned recently how much I love Chinooks? Seriously. It is mid-January in Alberta and it is six Celsius. I don't even need my coat. It makes me very happy. For all my Southern friends who think six is a little on the chilly side, not when December was generally -20 or so. Six is LOVELY. It's practically time to break out the flip-flops. For more quick takes visit Jennifer at Conversion Diary. It's amazing how much can change in a year. I took the boys sledding last year and nearly lost my mind. The clock may have said we were only out there twenty minutes, but really, the clock lied. It was 568 hours of crying, whining and sled flipping. It's taken me a year to work up the nerve to do it again. Now, mind you, we didn't have snow for six of those months, but still, I was rather apprehensive about tobogganing again. But something happened to change my mind. This week we are in the midst of a Chinook!!!!!! Which is my very favoritest weather phenomenon. It was a big factor in our decision to move back to Calgary. Which made it rather tough when we didn't get one last year. Way Cooler was NOT impressed. He'd heard about them, believed me, and did not get to see one. It was almost too much to take for my favorite winter wimp warm weather guy. There is still plenty of snow on the ground but it was five degrees (Celsius) out. It was too warm to NOT go sledding. And Way Cooler was working. Which meant that it was up to me. Because apparently social service takes a dim view of dropping your 3 and 5 year old at the hill and going to Starbucks. Which means social services has never gone tobogganing with preschoolers. So I promised myself a big chunk of chocolate if when we made it home and loaded up the new Christmas sleds. We found an empty corner of a popular tobogganing hill, just perfect for small sledders and off we went. It was so warm that no appendages even got chilly. I even took my coat off. Yee haw. They had the very best of times. When I am old I shall still remember small faces etched with glee as they took off down the "Very Big Hill". Sprout really got into it, which is quite amazing for the child who clung to me sobbing in terror last year. He even began to lie down in the sled as it shot down the hill. This most closely resembles luge. Without the helmet. The only downside, the toboggans are really too big for small arms to carry back up the very big hill and the riders too unsteady to position themselves at the top. Which meant that mommy walked up and down the hill Every.Single.Time. Who needs a personal trainer when you can toboggan with my babies? That's a lot of hill to go up and down and up and down and well, you get the picture. The very, very sore picture. Good thing I had that hunk of chocolate. Once again, I am participating in Sarah's book carnival. This is where I tell you what we found at the library that we LOVED. The problem this week is that this week's library finds THRILLED my boys. Me, not so much. It's as if every annoying book in the library found it's way into our bag. So, without further ado I give you a list of books to pull back out of the library bag after some eager pre-schooler has placed them there. 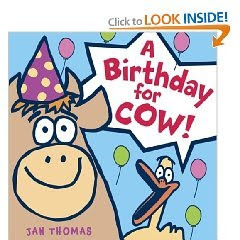 A Birthday for Cow. There is very little dialogue and the pictures are OVERbright, but apparently the punch line about a turnip is gut-splittingly HILARIOUS. Because really , is there anything funnier than a root vegetable? Not in this book there isn't. 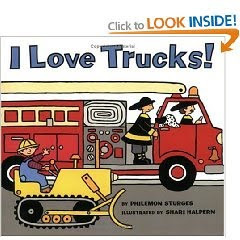 I Love Trucks. The problem with this one is that the boys like it because on time in a fit of boredom from reading it for the 784th time I started to roll all the r's. This is even funnier to them than a root vegetable. Not only is the story waaay too young for my kids, I feel like I'm auditioning for a Roll up the Rim commercial. However, this is truly the ultimate book for a toddler boy with an obsession with anything that moves. Look-Alikes Around the World I used to like this book. Six months ago. Now the mere sight of it makes my eyes bleed. We take it out a LOT. Basically it is everyday item used to make postcards from around the world. Picture brussel sprouts at the Taj Mahal and Grecian ruins made of pasta and dice. Yes, it is as cheesy as it sounds. While it is fun for my kids to look and find stuff, I'd rather they do this one ALONE. There was one book I did like this week. The boys LOVED it too. 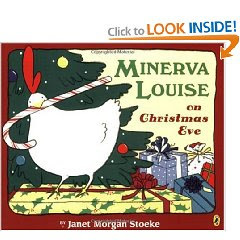 Minerva Louise on Christmas Eve. I had never read any of the Minerva books before and this one was perfect for my boys. It was pre-schooler funny, the pictures were cute and my boys got very involved in the simple story. VERY involved. I liked it because it had no hidden lesson, it wasn't too simplistic, it was just about a rather dumb chicken. Without being stupid. I cannot wait to find the other Minerva books. So what about you? What did you find this week? Head over to Sarah at This Heavenly Life and play along! P.S. I read a book for me this week that I want to tell you about, but I'm thinking it gets it's own special post. My week wasn't ALL turnips and talking chickens. Praise God for that. So Maybe I shouldn't Take up Stand-Up Comedy. Way Cooler read my last post and looked at me blankly. "But you do that stuff already." "I know. I won't fail! IT'S PERFECT." "But it's not a real resolution unless you change something!" "Well, I know that. I was being funny." "Really? You thought that was funny?" This from a guy who write about stock picks for fun. So, while I didn't succeed in making him laugh, he sure made me laugh last night. I am not the only one in this relationship who hates being late. We both have an unswerving need to be on time. This can be a bit challenging for Way Cooler sometimes as he is NOT a morning person and now that he is a shift worker some of his shifts start at 6:00. In the AM. Which means he must leave the house NO later than 5:20. While it is tough for him, he has always been on time. But this morning he woke up and saw that it was 32 after. He panicked, flung himself out of bed, raced to get dressed and headed for his car. All that flinging and panicking woke me up and because I AM a morning person I figured I might as well get up too and get stuff done. So I toddled off to the bathroom, heard him leave and then headed downstairs. HG: Where you going hon? HG: IT's 12:35. Not 5:35. WC: See you in a minute. And that is where is the conversation ended because I was laughing too hard to talk. I may not have made him laugh yesterday, but I sure fell back asleep laughing this morning. Lots of bloggers are posting their new Years Resolutions online for accountability. I like that. So I thought I'd play along. Here are the Geek's resolutions. 1. In 2010 I plan to always be on time. 2. I am going to work hard at not shopping for shoes as much. 3. I resolve to make all my own bread. 5. I plan to make sure I do not hyper -organize my family.